Hi Everybody! It's Thursday and time for another post. Again I've been busy at my Soldering Station since my last visit. Thought it might be nice to share some of my newest creations. For years I've been collecting German Half-Dolls. I think they're precious, and the smaller the lovelier. Ironically I've always kept my cherished pieces housed behind glass. Always wanted to display them openly on perhaps a vanity or tabletop but just never thought they looked properly scaled until now. 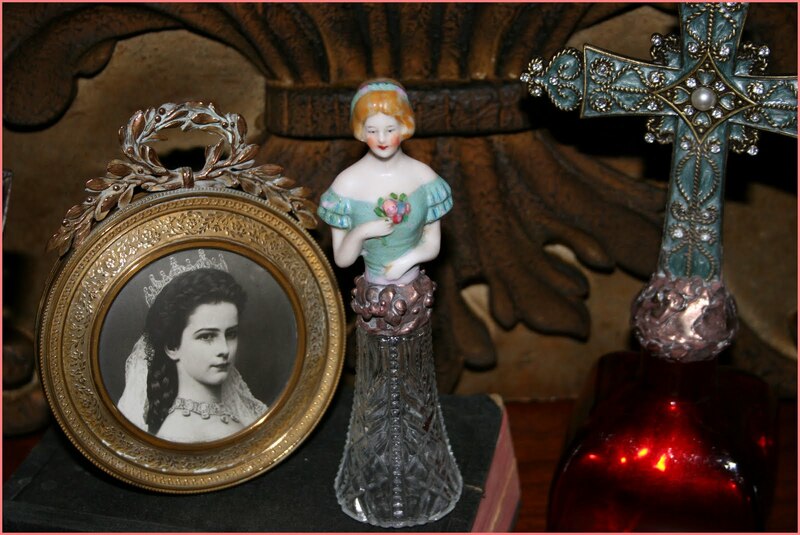 I've surely taken them to a new level by permanently positioning them to everything from Vintage Ink Bottles to Heavy Crystal Decanter Tops..you name it..if I think it's beautiful, I'll try and make a new home for my ladies with it. I've been experimenting with Patina too. I'm loving the chic Black with Silver Highlights, but this week I'm using Copper with slight blue undertones. To me, the effect compliments the porcelain beautifully. Also created another Cross Bottle..This one is Ruby Red and looks sensationally chic. I love how the Turquoise Cross shimmers and it's becoming difficult for me to decide which of my new pretties I like the best. I'll be listing a couple of these pieces today in my Etsy Shop. Afterwards, it'll be back to my Soldering Station for me. I'm so in love with this technique right now. I hope y'all will leave some feedback comments for me. Just curious to what y'all think of my current fasinations. And Thanks So Much For Dropping By! Actually time ago I was thinking to start make glass beads for my jewelry, but... the life makes her corrections and I have to leave it for a future. Where is Bonaire? I thought I knew all of Georgia! I have been thinking of you, and hearing your voice in my sleep. I must call you soon. I am still so hoarse most people cannot understand what I am saying. They are sending me to the Ear, Nose and Throat specialist next Friday so that he can go down my throat and examine my larnyx. They want to make sure it is the coughing that has caused the hoarsness and not something else we need to be concerned about. Oh sweetie, I absolutely love your new creations. Talk about gorgeous. The angel is beautiful, and the red heart, oh my be still my heart. What a truly talented artist you are sweet friend. I read some of the articles and your sweet Moma is a busy gal stacking these days. So she needed cooking room hu? Isn't she precious? I love the picture of the two of you together. You look like your Moma Terri. You two are so sweet together. I hope you have a beautiful weekend sweetie. You are such a precious gift to your Moma and she to you. Kiss her for me, and remind her she is so loved. How is the reading going? 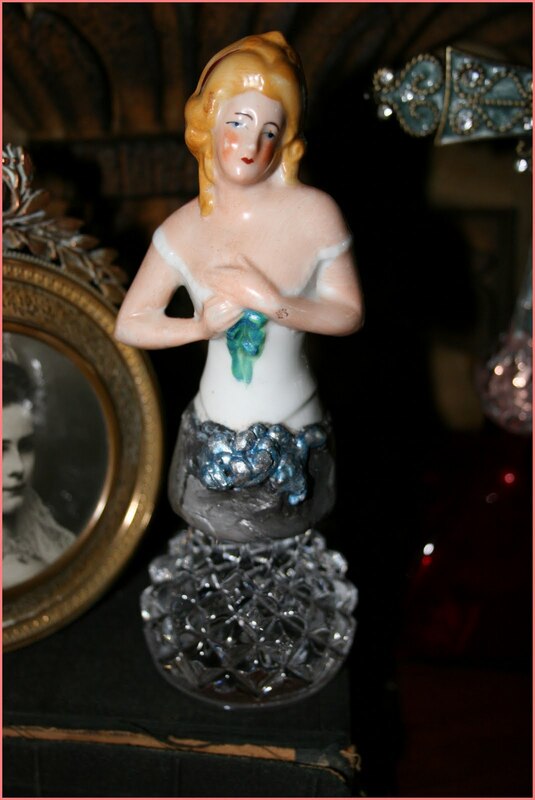 Dearest Terri, your collection of german hald dolls are amazingly beautiful!! 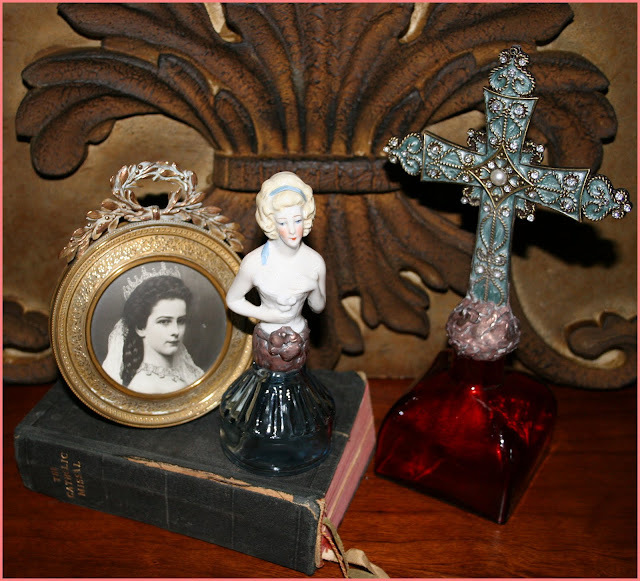 Your Cross Bottle is really gorgeous....i am in love with your creations! So happy to have stop by your lovely and very inspiring space here! Have a lovely merry happy weekend and love to you! Oh, OH!! 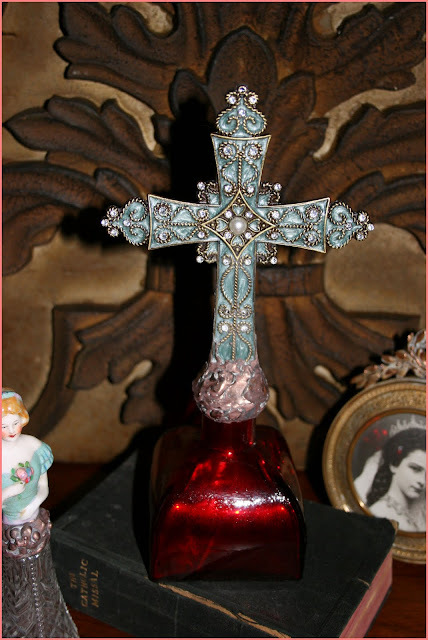 sweet Terri ... this is the most beautiful cross ... I'll have to see if you have pink & green ones ... you are truly an exquisite artist, your beauty shines thru in each piece you design. I know you all must be suffering in the same haet wave we are ... oy! it is hotter than you know where!, for sure. Give Mother a big hug & lots of love sent for you. PS I captured y & posted your button, sweet friend. I wanted to stop by and say hello to you and thank you for your sweet post the other day on my blog. You asked where I live in Georgia...I live in Woodstock GA. We moved from Roswell two years ago and have lived in GA since 2006. We moved here because of my husbands work and had previously lived in Colorado. So what have you been up to lately? I love the beautiful bottles you have embellished. I will write to you again soon my friend. I know it has been a while since we have last visited each other but I understand, it is not always possible to keep up with blog friends. Thank you anyway for your lovely message. The glass cross bottle is my absolute favorite but then again, i have a thing for crosses. i love the red with the turquoise. really really pretty. I saw these items over at Kims and boy did they grab my attention. They are all beautiful. 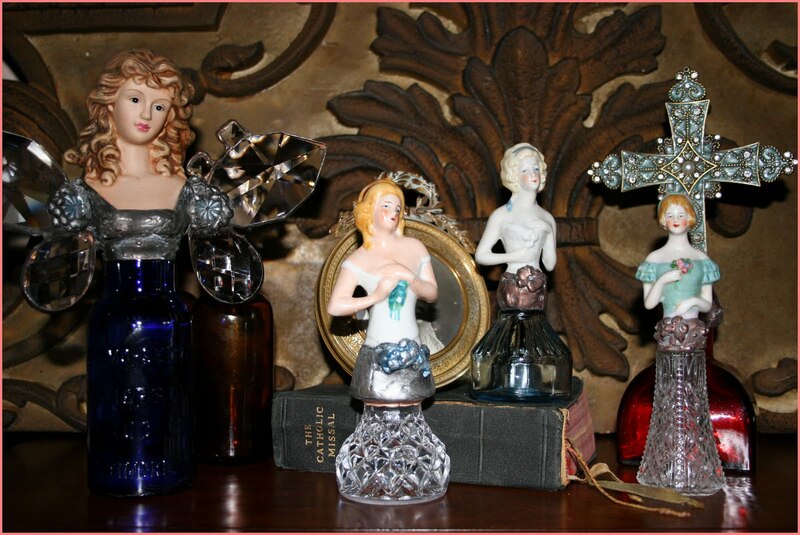 I love the way you have situated the ladies on the bottles. Stunning. I'm your newest follower. I would love for you to stop by and follow me in return!